Fishing is a very spiritual experience. You’re out in the midst of creation, usually away from the distractions of civilization … at least for the best fishing spots. There’s a quiet, almost solitary ambiance … so as not to disturb the fish. There’s a lot of waiting … letting the fish come to you. Fishing must be in my DNA. I have no other way to explain how my sister, brother, and I, and my two cousins, ever got so interested in fishing. I certainly can’t imagine my three granddaughters, ages 7, 4, and 2, sitting quietly in a boat for hours! I’m sure my family had me out fishing as an infant and I have lots of earl memories of being out fishing. Going fishing was always on the family vacation agenda. There were usually three fishing options. We never had enough time to do all three during one vacation period. 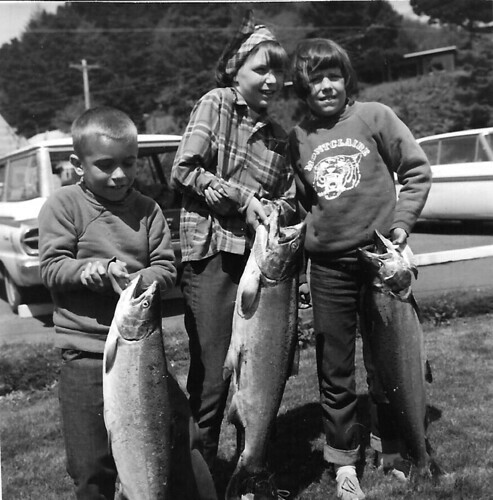 If we were over at the beach cabin, we usually had one day deep sea fishing out of Depot Bay and the rest of the time was spent fishing on the Little Nestucca River. If we were going to Paulina Lake, that was usually five days out in eastern Oregon. We didn’t care where we were going. It was all serious fishing fun. My grandfather was the zen master of fishing. Grandpa had this laid-back aura about him. He was methodical and everything was a teachable moment. Actually, everything was more like an opportunity for a story! It would take him hours to pull all of the fishing gear together, much to Grandma’s displeasure, but there was a story behind just about everything he touched or the systematic approach to getting ready. He’d keep us busy for hours, getting all the already-organized-fishing poles and tackle organized for the trip to the beach or Paulina. And then there was the boat. Yes, this is the same Grandpa who bought a 26-foot deep sea fishing boat I mentioned in The Dairy Queen. But that’s not the boat I’m talking about here. This boat was much smaller and we used it when fishing the Little Nestucca or Paulina Lake. It had an engine and seated about seven of us, give or take how many kids were on that boat. It was a beautiful little boat and it had no amenities. Well, it had a metal coffee can for that, although as we got older, we did schedule a shore stop and each go find our own tree. As any good fisher person, I have my own score of fishing stories, which will be continued in The Zen of Fishing. And for those of you wondering, yes, we all caught the fish we’re holding in the picture! My cousin Tom is on the left and was about 7. I’m in the middle and was probably around 11 and my sister, Janet, was probably 10. Since these are salmon, I’m guessing we caught these deep sea fishing out of Depoe Bay or at the mouth of the Little Nestucca where it runs into the Pacific Ocean. It was Linda that caught the perch and got so upset when we found the babies inside. No, Janet caught the perch. She and I were on fish cleaning detail. I think we were both upset about the babies, but it didn’t stop us from eating it!